The world of art is something that has been both an enjoyable visually and investment for some. 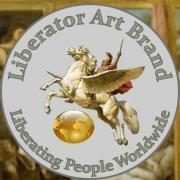 Zig Gruz's company "Liberator Art" has pieces that you can use for both. Besides acquiring art from some of the world's best artists, they also offer pieces for the beginner art enthusiast. The company guarantees their art will not depreciate in for a decade. We will talk to Gruz about his company, about the ever expanding art world, and how he is revolutionizing investing.